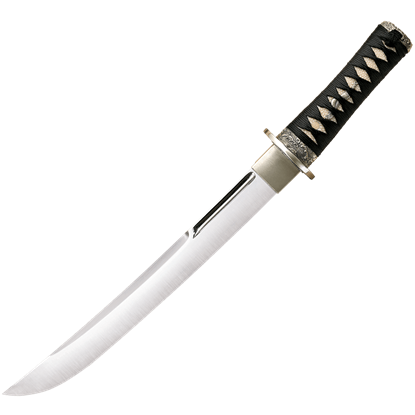 One of the iconic blades of Japan, the tanto is a Japanese dagger used by samurai during the feudal period. 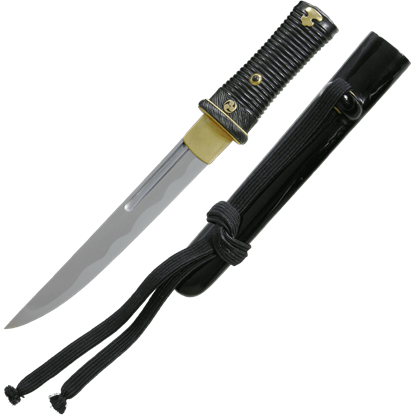 Strictly speaking, a functional tanto possesses a guard and has all of the fittings of a larger sword like a katana or wakizashi. 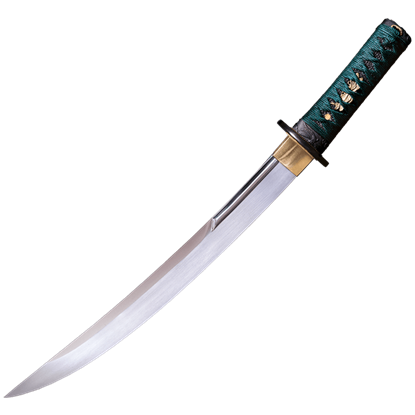 The Japanese tanto blade rarely exceeds 12 inches in length. A traditional tanto was usually carried along with a katana as a kind of side arm. 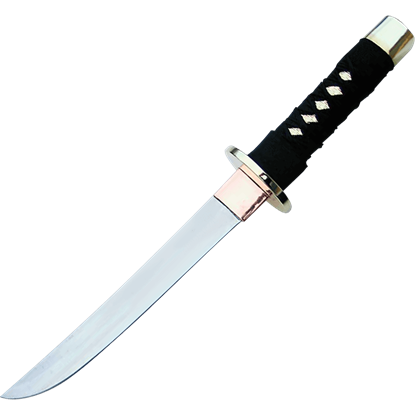 The Japanese tanto was not left at the door when paying a visit, unlike a katana, making it a useful self-defense tool in case of an unexpected attack. 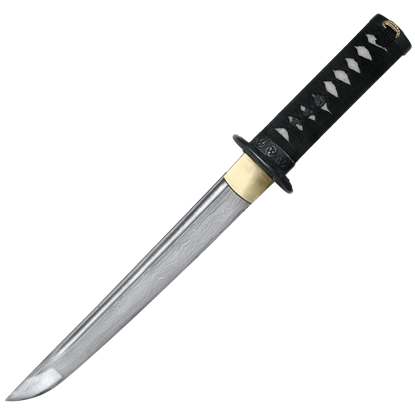 The samurai tanto was designed primarily as a stabbing instrument, but the edge could be used to slash as well. In addition to samurai, women sometimes carried a small tanto called a kaiken in their obi for self-defense. We carry many collectible tantos with authentic detailing and construction. Our Japanese blades look great on display when they are not in use. Collectors of Japanese blades will find few examples of quality craftsmanship better than the Black Dragon Damascus Tanto. This functional tanto is crafted from high carbon Damascus steel with a fuller and real ray skin handle. 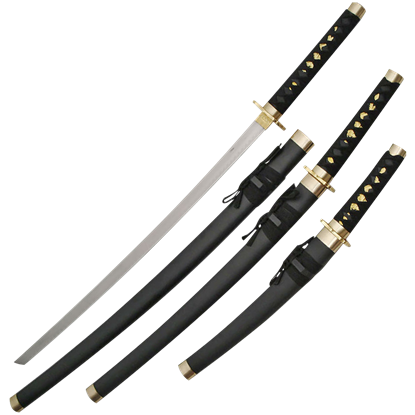 Show honor and strength when you display this Black Japanese Sword Set. 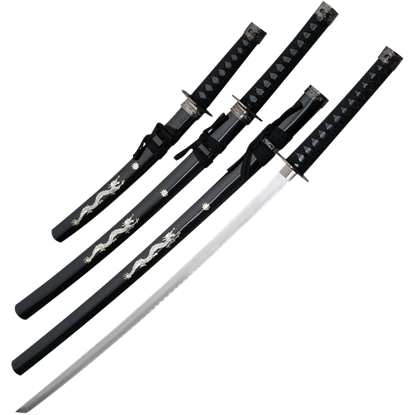 This set includes a katana, a wakizashi, and a tanto, the three blades of ancient Japanese samurai. Each traditional weapon is perfectly matched to the other. The Black Pearl Dragon Japanese Sword Set includes three perfectly matched Japanese samurai blades, a katana, a wakizashi, and a tanto, all with beautifully pearlescent, traditional dragon designs on their solid black scabbards. 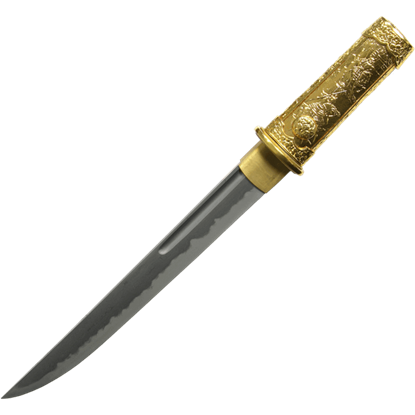 Offering a modern spin on the traditional Japanese blade, the Brass Menuki Samurai Tanto makes an excellent collectible weapon to add to your collection. This functional oriental dagger possesses a striking appearance. Bushido, or Way of the Warrior, defines the code of conduct an honorable Samurai must follow. Much more than the western ideal of chivalry Bushido is a way of life. The koshirae of our Bushido set features various samurai battle scenes. 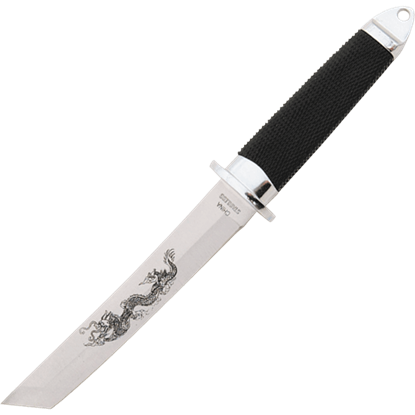 A fantastic choice for knife and dragon enthusiasts, this Dragon Tanto features an etched black dragon slithering down the blade. 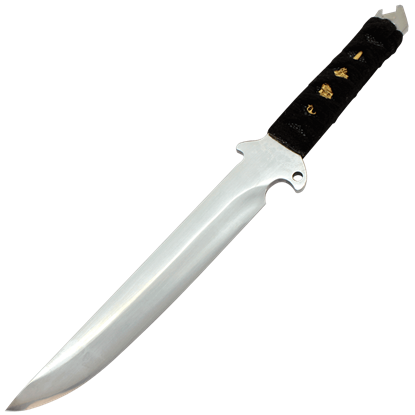 This stainless steel fixed blade knife displays the pronounced chisel tip of an American style tanto. The craftsmanship of traditional Japanese blades has been celebrated for centuries. Enjoy the elegance and strength of the historic tanto of the samurai with the Dragonfly Tanto, skillfully designed for the modern day warrior. Having completed the assigned tasks, the student stands before the tribunal. He finds peace within while they deliberate. Soon the weaponsmaster approaches, offering the Elegant Samurai Tanto as confirmation of his new status. 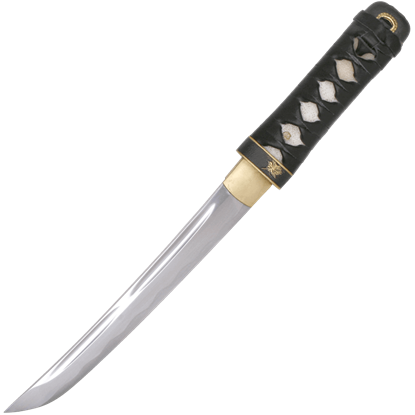 Made famous in feudal era Japan, tantos feature short blades with a sharpened edge which excels in thrusting strikes. The Golden Warrior Samurai Tanto is functional designed and stays true to this historic style. The furniture of each piece in the Great Wave Set displays the renowned Tomoe motif used frequently for family crests and shrine decoration. The tsuba, fuchi, and kashira are made of blackened iron and feature the Tomoe crest (mon). Situated within the folds of his obi sash, the emperor displays his beloved knife, the Imperial Tanto. Adorned in gold and the royal insignia, this incredible piece displays his honor and authority in stunning detail and design. The fittings of the Imperial Tanto are expertly made to give it the finest look possible, and its modern carbon steel blade is heat treated to a spring temper, making this gorgeous replica tanto a functional, battle-ready weapon. I love the quality, great selection, and affordability! Great company, and true to your word.